The brand new tablet/smartphone/GPU you grabbed last week is the cat's meow. But what happens to it - or to any of the devices you once treasured- when you don't want or need them anymore? Where do they go? Is there a reliable, "green" way to dispose of them? And hey, does one extra electronic gadget in a landfill really put the big hurt on the environment? As you'll see in the pages ahead, there's a whole bunch of stuff not to like about the way we deal with our old and unloved electronics. We toss way too much of it. We recycle some of it, but even then the machinery behind that recycling is flawed and we're only beginning to understand the dangers that come from the hazardous materials that lay inside. Changes are afoot, but the evidence of an apathetic past and present, like the e-waste itself, is piling up. Let's start simple by looking at one of today's most ubiquitous electronic gadgets, the cellphone or smart phone. While there's no validated evidence to suggest the persistent use of cell phones will trigger brain tumors – despite lots of hype to the contrary – the cell phone is far from green. Indeed, it houses a lot of stuff you certainly wouldn't want to sprinkle on your cereal. Stuff like copper, gold, lead, nickel, antimony, zinc, beryllium, tantalum, mercury, arsenic, and coltan (more on coltan in a moment), among others. While most of these materials are part of the finished item, others play a critical role in the production process and remain onboard afterward. Some are found on the circuit board, others in the display. Or in the battery. Or in the wiring or the solder that flows between all of the above. And let's not forget the glue that holds so much of the innards together. Or the packaging, which in many instances is the very definition of excessive. Or the plastic shell, which contains crude oil, natural gas, and chemicals. Also generally less than green are the methods in which some of the "ingredients" are acquired. Coltan, for example, a vital element in the production of cell phone-level capacitors, is currently the subject of much controversy. The majority of coltan is mined in the Democratic Republic of Congo, where human rights organizations claim the people who mine it live and work in deplorable conditions, surviving on less than $1000 a year and digging underground without safety equipment or supplemental air supplies. Animal rights organizations claim the regional gorilla population is impacted in two ways – by dwindling food supplies in the mining zones and because some are used as meat to feed the miners. Add to that the UN, which says that most of the parties involved in the mining and sale of coltan are also involved in the local civil war. Not exactly a glowing summary of earth friendliness. The Numbers: How Much E-Waste Are We Talking About? But here's the thing – this whole cell phone business wouldn't be quite so overwhelming to fix if so damn many of them didn't end up in the garbage. Once trashed, a cell phone travels to the local landfill, where it's compacted, smashed, crunched, and/or burned until everything that was once safely ensconced inside spews out and over the course of months, years, and decades, leaches into the air, ground, and water. And in large doses, the stuff inside a cell phone – as is the case with most electronics – has been linked to critical health concerns such as cancer, birth defects, brain afflictions, and damage to the nervous, reproductive, digestive, lymphatic, and immune systems. Even the brominated flame retardants that coat the plastic case of many cell phones, guarding against the accidental ignition of the materials inside, become potentially toxic once said case is compromised. Granted, a single cell phone lying in a single landfill isn't of tremendous concern. But we're not talking a single cell phone. How many are we talking? Well…the United Nations says sixty percent of the world's total population owns at least one. Think about that for a moment. Perhaps even more telling are recent reports claiming a whopping five billion mobile phone subscriptions are currently in place worldwide. Now, consider how many of these users are already on their second, third, or fourth cell, and you begin to get the picture. But the truly scary part? Most reliable estimates say that no more than ten to fifteen percent of all cell phones are recycled. And that figure applies only here in the good old USA. One can only imagine how that figure varies in countries where recycling is a virtual unknown. Ultimately, one can say with some confidence that literally billions of cell phones have been discarded over the course of the last three decades, all of which are now in the process of breakdown. Of course, cell phones play but a minor role in a very big story – the story of electronics at the end of their life cycle. The story of e-waste. Let's check out some numbers. There are, right this very moment, more than a billion computers worldwide. Two hundred million televisions were sold is 2009 alone. Eight million dashtop GPS units were purchased in 2008. One hundred and ten million digital cameras were sold in 2009. Apple blew out 20 million iPods in just the first quarter of that same year. Indeed, according to a November 2010 report published by think-tank Demos and penned by author Elizabeth Grossman (a journalist specializing in environmental and science issues and the author of "High Tech Trash"), there are three billion electronics products currently in use in America alone. That's a fifty percent increase since 2007 – and a turnover rate of 400 million per annum. Clearly, these are staggering figures, and certainly more proof – as if we needed it – that we live in a disposable society. Back in the day, an electronic item such as a table top radio might very well have held its place inside a home for decades. Not necessarily because it was better built than today's radios – though many would say it was – but because there weren't a ton of home and personal entertainment options apart from radios. Moreover, evolution moved at a much slower pace. It took some time to build a radio, and even then there were only a precious few options to enhance. Ultimately, there simply weren't many truly compelling reasons for a consumer to move to a newer model. Contrast old school radios to, say, the television marketplace of the last decade. First, we dumped our bulky, energy-sucking CRT TVs. (CRT technology, by the way, is widely considered to have the foulest environmental footprint in the entire electronic world – each display housing several pounds of lead and copious quantities of toxic goodies such as mercury, cadmium, and arsenic.) We then jumped on the flat-panel bandwagon, but soon thereafter we discovered the joys of true 1080p high-definition. And many of us changed over yet again. Now, for better or worse, there's 3DTV. All in the span of ten years. Now think about the length of time you keep any of your modern electronics before you give them up, either because they're broken or more likely because they've been supplanted by something faster/better. Five years? Two? Look at the iPad as an example. Between the release of the original and the release of the follow-up, complete with its slimmer build, upgraded CPU, superior cameras, and other incremental improvements that Apple maniacs worship, there was just a single year. Apple sold fifteen million original iPads. But now, for many, they're passé. And let's not forget – not all unused products are immediately given the heave-ho. Consumers tend to stockpile stuff they don't use any longer. Admit it – how many old game consoles or cell phones or laptops or TVs or cameras or cd players, Walkmans, record players, spare monitors are sitting around your house right now because you'll either use them again one day (fat chance), or because you just don't know what to do about it? There are a lot of people like you. In a 2005 study commissioned for HP by market research firm Penn Schoen Berland, it was said that sixty-eight percent of consumers stockpile used or unwanted computer equipment in their homes. In a 2008 EPA study of select electronics sold between 1980 and 2007 –specifically items like televisions, computers and peripherals, hard copy imaging devices such as printers and scanners, and cell phones – it was found that more than 235 million units had accumulated in storage by 2007. We're willing to bet dollars to donuts that figure has increased substantially since then, given the onslaught of portable, personal devices in the past few years. The Alternative Option: What Happens When Tech is Recycled? The answer, of course, is recycling. And reusing. And renewing. And that's where things get interesting. For starters, there's no doubt the process, when carried out in a responsible, forward-thinking manner, works. We asked the folks at Illinois-based Intercon Solutions, a progressive recycler that specializes in electronics and recycles everything it receives – no reselling, remarketing, land filling, incineration, or exportation – to give us the lowdown on what happens to our friend the cell phone when it hits the Intercon facility. And they told us. But not without first advising us that Intercon, like many of today's top-rung facilities, prefers the term "de-manufacture" to "recycle," - and for good reason, as you'll soon see. When Itercon first receives a cell phone (or a smart phone or an MP3 player – the process is similar), it places the item with others of its own type and weight. This continues until 25 pallet-sized boxes are filled, at which point item teardown begins. Intercon cautions that although teardown may look similar to a standard assembly line, it's actually a "de-assembly" line where individual items are de-manufactured or disassembled – by hand. In any case, plastics, glass and all the different metals found in smart phones and MP3 players are separated. Then each metal – gold, silver, lead, aluminum, iron, copper, brass, palladium, rhodium, and more – is further sorted into individual lots. Once separated, each component is passed on to one of Intercon's domestic smelting partners, all of which must meet the requirements of the company's ISO 9001 and 14001, OHSAS 18001, RIOS, R2, and NAID AAA certifications. There are no offshore handoffs. The plastics, glass, and metals are smelted into bars, ingots, or sows, while the glass, lead, and precious metal items are recycled back into new electronic circuitry. The plastics are, interestingly, remanufactured into parking bumpers. You see, recycled plastic from items such as cell phones have traditionally been used in the fabrication of asphalt roads and composite decking. But parking bumpers, we're told, aren't nearly so prone to leaching. One more thing: Intercon has recently developed a "reverse engineering" method for recycling and reusing what was once considered a wholly unrecyclable product – Styrofoam. Though Styrofoam (also known as polystyrene) isn't exactly electronic in nature, it inevitably goes hand-in-hand with the packaging of said electronics and takes hundreds of years to degrade once trashed. In our minds, the less Styrofoam in the trash, the better. Ultimately, the big problem with responsible recycling is not that it can't be done, but that it often isn't. For all the Intercons, there are seemingly oodles more non-Intercons. Is there any guarantee that the item you dutifully send for recycling will be recycled properly? Apparently, in many cases, the answer is no. The people of Ghana know this all too well. You see, Ghana, along with regions of India, Nigeria, China, and several other locations, have become the world's electronic dumping ground. There, old, unused, unloved, and outmoded electronics arrive by the boatload, often under the guise of recycling. Sadly, the word "recycle" means something very different there than it does here. An August 2008 Greenpeace report chronicles the process, and its findings are far from uplifting. In this unregulated and often unmonitored environment where the average annual wage is expressed in the hundreds of dollars, tech products are burned over open flames to separate the plastic from the more valuable metals. Products with little or no value are dumped in nearby pits. Needless to say, the threat of escaping toxins is not a threat at all – it's a reality. Eighty percent of the children in Guiyu, China, another region that receives recyclable electronics, are known to have elevated levels of lead in their blood due to the toxins found in these electronics. Worse still, the Greenpeace study (a study that has since been corroborated by other organizations) determined much of the hard labor is performed by teenage boys, some as young as eleven. Most toil through each long day bereft of protective equipment and with little or no knowledge of safe handling procedures. Arguably of equal concern is the widespread abuse of the otherwise wonderfully humanitarian "Bridge the Digital Divide" program, wherein nations of wealth pass along older yet fully functioning tech to impoverished peoples. The theory being, of course, that a circa-2000 computer means a hell of a lot more to a Ghanaian schoolhouse than the busy New York executive who parted ways with it. Yet, according to Greenpeace and its sources, anywhere from twenty-five to seventy five percent of second-hand "reusable" goods that land in developing nations are in fact broken beyond repair and of use to no one. That these devices then end up in the tech killing fields we cited earlier comes as no surprise. So, why do such practices exist? Greed. XYX Recycling picks up a load of goods and instead of dealing with it as it should, it merely chucks it on the next boat to Ghana. Out of sight, out of mind, money in pocket. In all fairness, electronics recycling is a comparatively new idea, and regulations are continually being initiated to ensure the procedure is conscientiously carried out. Penalties are levied and wayward recycling practices are now being monitored more closely than ever. Case in point: On Feb 18th of this year, two recycling businesses, Toronto-based Metro Metals Corp. and Avista Recycling, Inc., were hit with a $31,600 penalty and ordered to properly dispose of the goods at their own cost for relabeling 913 CRT-based monitors as scrap plastic and attempting to ship them off to Vietnam. And in June of last year, the City Council of the town of Plymouth, England, was fined £8,000 ($13,000) for allowing unauthorised firms to remove and sell unwanted computers from its waste plants. It was determined the council breached the Waste Electrical and Electronic Equipment (WEEE) directive by allowing firms to take charge of electronics without first ascertaining if those firms were bona fide recyclers. Having said that, the disposition of electronics clearly has a long way to go, as does the manufacture of such products. After all, wouldn't it be nice if all the components in our cell phones and tablets and PCs wasn't such damaging stuff in the first place? Certainly it would, and not just for us consumers either. Truth is that the even the production of high-tech electronics – and in particular semiconductors – can be extremely hazardous to one's health. You see, there's a secondary reason for those clean rooms and protective bunny suits you see portrayed in tech industry television advertisements. Sure, they keep the product free of contaminants. But they also serve to shield the employees. Without such safeguards, workers en masse would be exposed to the chemicals involved in semiconductor manufacture. For many years now, reports of miscarriages, skin disorders, and incidents of cancers such as leukaemia or lymphoma have buzzed about the industry. In 2004, for example, a jury ruled IBM was not responsible for fatal cancers that developed in two former employees at a disk drive factory. The suit claimed harsh chemicals in the factory caused the deaths, and though IBM was ultimately cleared, it's one of several similar allegations levelled against the company. More recently, Samsung came under fire in 2010 for the death of a former employee who succumbed, at the age of 23, to blood cancer. This was but one of several deaths and afflictions attributed to Samsung's Onyag, South Korea semiconductor facility. Barbara Kyle, National Coordinator of the Electronics TakeBack Coalition, a San Francisco-based organization that promotes green design and responsible recycling in the electronics industry, says producers are taking steps to improve the manufacturing process, but cautions there is a very long way to go. Kyle tells us that the ongoing elimination of high-concern chemicals such as halogenated flame retardants "is a good start, but understand that this industry uses many, many chemicals that are barely tested for hazards before they are put into commerce." Elizabeth Grossman believes the entire process – from product conception to afterlife – should be in harmony. "As someone said to me when I was working on High Tech Trash, it should be as easy to recycle a computer as it is to buy one – this should be true of any piece of consumer electronics – and part of what will make this happen, in addition to making the recycling easy and convenient for consumers (whether for individual, workplace or school use), is to have product design evolve to make the equipment last longer and be designed for extended life through technology upgrades, and ultimately to be made of non-toxic and reusable materials." But if manufacturers are only beginning to develop a methodology to reduce or exclude toxic materials while keeping costs in line and to ensure truly green and perhaps semi-immortal machines, the hard, cold truth would appear to be that we, as a people, simply aren't doing enough in the meantime to ensure large-scale accountable recycling. We mentioned the recycling ratio for cell phones earlier – a dismal ten to fifteen percent. This figure appears to be the norm for all forms of electronics and high-tech devices. According to the EPA, in excess of 372 million electronics products units, weighing 3.16 million tons, were disposed of in the USA in 2007 and 2008 alone. 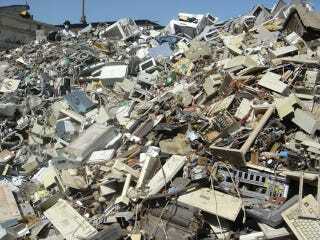 Just fourteen percent of this was destined for recycling, leaving fully eighty-six percent to be burned or compacted. 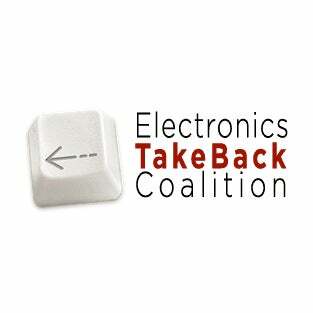 Computer users, sadly, might be the worst of the bunch – the Electronics TakeBack Coalition calculated that in 2007, some 112,000 computers were discarded in the U.S. each and every day. Like the manufacturers, it would seem the population in general needs incentive (rebates, discounts, rules, penalties) to make recycling an integral process. Yet in many states, because it's legal even right now to toss your tech gizmos in the trash, so most of us apparently believe it's true. The Olusosum dump site in Lagos; Image Courtesy of Greenpeace. But all is not lost. Approximately half the states in our union have now enacted some form of ban against the dumping of most common electronics products. Most legislation doesn't go so far as banning the export of e-waste to third-world countries, but it's definitely a start. On the federal level, the recently introduced Responsible Electronics Recycling Act of 2010 proposes hefty fines for those who wrongly export electronic waste to developing countries. Critics say the bill doesn't have enough bite, but proponents claim something is better than nothing. Furthermore, on November 15, 2010, President Obama issued an electronics recycling presidential proclamation, announcing he was creating an interagency task force within the federal government "to prepare a national strategy for responsible electronics stewardship, including improvements to federal procedures for managing electronic products." Barbara Kyle, whose organization is involved with the "e-Stewards Program," a new certification standard that keeps member recyclers on their toes and helps consumers identify those recyclers that adhere to its vigorous standards, believes a fully regulated environment is mandatory if we're ever to see true change. "It's been very instructive to look at the results from each of the states," says Kyle. "We see much higher recycling volumes from most manufacturers in states where the law requires them to meet certain performance goals. So most companies do only what's required under the law." "There are a few exceptions, but looking at the numbers from Texas, which has a relatively weak computer recycling law that doesn't specify any level of performance, speaks volumes. Last year, Dell collected ten million pounds in Texas, while HP collected about 45,000. Dell and HP have roughly the same market share but clearly made wildly different efforts here. Yet Lenovo – a fast growing company – collected only ten pounds. Yes, ten. What's the lesson here? Pass strong recycling laws, or you won't see much recycling by these companies." One other consumer option that's just recently getting play is "takeback." Essentially, takeback is just that – electronics manufacturers taking back products at the end of their life cycle and thus reducing the need for independent recycling. According to Kyle, "Strong takeback means two major things: Making the effort to actually get products back to recycle them, and making sure the products are recycled responsibly – not just exported to developing nations." Kyle once again gives the thumbs up to Dell, among others. "Dell is currently making the most effort to take back their old products. Back in 2001, they were the target of our campaigning – they had no free takeback at all. Now they do more than other companies even in states where the law doesn't require them to. For the TV companies, Samsung has been a leader in some states doing takeback, and in committing to use vendors certified to the e-Stewards recycling standard. Best Buy – which is also a TV manufacturer – has also been steadily growing their takeback program and is working with e-Stewards." Greenpeace, in its own study that ranks the most dominant tech producers in terms of their environmental footprint, rates Dell mid-pack, while praising Nokia and Sony Ericsson and slamming Nintendo and Microsoft. Read the Greenpeace guide for yourself. Newsweek, meanwhile, which ranks the top 500 largest publically traded companies in terms of their greenness, says tech is one of the cleanest sectors of all and rates Dell and HP in the numbers one and two positions. You can see its full 2010 Green Rankings here. Though all of the above paints a murky picture, it also paints a picture of obvious transition. And certainly, there does appear to be enough independent whistle-blowers, responsible manufacturers, and government intervention to ensure the future is at least better than the past. But right now, there are steps you can take to help. Ghana Scrapyard; Image Courtesy of Greenpeace. 2. If you're in the market for a replacement device, first consider the options. Is your current product upgradeable? Do you really need those new features? 3. Buy products that are part of a manufacturer "takeback" program. 4. Sell your old but functioning products on an online classified ad site, or donate them to a responsible local charity or organization. And don't forget – you may be eligible for a charitable donation receipt. 5. Patronize manufacturers and retailers that have strong green principles. Check their websites and the links in this article. 7. Give yourself a cool-down period before jumping on the Next Big Thing. And if the cool-down fails, quietly ponder the gobs of cash you've sunk into the "latest and greatest" in the past. And be sad. 10. Consult the EPA page for lots of good information on recycling, takeback, and donation programs.